"Lenore", sometimes translated as "Leonora", "Leonore" or "Ellenore", is a poem written by German author Gottfried August Bürger in 1773, and published in 1774 in the Göttinger Musenalmanach. Lenore is generally characterised as being part of the 18th century Gothic ballads, and although the character that returns from its grave in the poem is not considered to be a vampire, the poem has been very influential on vampire literature. William Taylor, who published the first English translation of the ballad, would later claim that "no German poem has been so repeatedly translated into English as 'Ellenore'". In the 18th century there were more than eighteen hundred different German-speaking political entities in Central Europe. During this period, due to influences from the Renaissance and the Enlightenment, Latin and French dominated over the German language, and German literature had mostly been modelled after French and Italian literature. These factors lead few scholars to recognize the existence of a distinct German culture or literature. The idioms are the elegances of which no neighbor can deprive us and they are sacred to the tutelary goddess of the language. They are the elegances woven into the spirit of the language, and this spirit is destroyed if they are taken out. [...] Take the idiomatic out of a language and you take its spirit and power. [...] The idioms of the time of the Meistersänger, of Opitz and Logau, of Luther, etc. should be collected [...] And if they are good for nothing else they will at least open the way to the student of the language so he can understand the genius of the nationality, and explain one by the other. The idioms of every language are the impressions of its country, its nationality, its history. It will remain eternally true that if we have no Volk, we shall have no public, no nationality, no literature of our own which shall live and work in us. Unless our literature is founded on our Volk, we shall write eternally for closet sages and disgusting critics out of whose mouths and stomachs we shall get back what we have given. Bürger answered Herder's plea by publishing "Lenore", which had been suggested to him by a Low German Volkslied, similar to the Scottish ballad of "Sweet William's Ghost" collected in Percy's Reliques. William Taylor has also compared Lenore to "an obscure English ballad called 'The Suffolk Miracle'", in which a young man appears to his sweetheart, who has no knowledge that he had already died, and carries her on horseback for forty miles until the man complains he has a headache, which leads the maid to tie her handkerchief around his head. After they depart, the young maid returns home and is informed by her father that her lover had in fact died, whereupon he goes to the young man's grave and digs up the bones, finding that his daughter's handkerchief is tied around the skull. Although the Battle of Prague is over, William, the fiancé of a young woman named Lenore, has not returned from the Seven Years' War yet. Ever since he had gone to battle in the army of King Frederick, Lenore has been impatiently worrying about William every day and longing for his return, but she has not heard any news from him. When the other warriors return from the war without William, she begins to quarrel with God, complaining about His unfairness and proclaiming that He has never done her any good, which prompts her mother to ask for her daughter's forgiveness because she knows that such a thought is blasphemous and will condemn her to Hell. Lenore's mother also suggests that William probably found another woman in Hungary, and that Lenore should forget him. At midnight, a mysterious stranger who looks like William knocks on the door searching for Lenore and asks her to accompany him on horseback to their marriage bed. Lenore happily gets on the stranger's black steed and the two ride at a frenetic pace, under the moonlight, along a path filled with eerie landscapes. 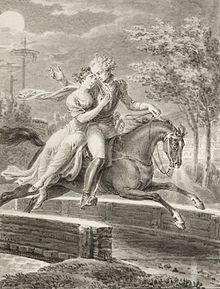 Terrorised, Lenore demands to know why they are riding so fast, to which he responds that they are doing so because "the dead travel fast" ("die Todten reiten schnell"). Lenore asks William to "leave the dead alone" ("Laß sie ruhn, die Todten"). At sunrise, their journey ends and they arrive at the cemetery's doors. As the horse goes through the tombstones, the knight begins to lose its human appearance, and is revealed as Death, a skeleton with a scythe and an hourglass. The marriage bed is shown to be the grave where, together with his shattered armour, William's skeleton lies. The ground beneath Lenore's feet begins to crumble and the spirits, dancing in the moonlight, surround dying Lenore, declaring that "no one is to quarrel with God in Heaven" ("mit Gott im Himmel hadre nicht"). However, Lenore, punished with death, still has hope for forgiveness ("des Leibes bist du ledig/Gott sei der Seele gnädig"). [Lenore] exerted a more widespread influence than perhaps any other short poem in the literature of the world. [...] like wildfire, this remarkable ballad swept across Europe, from Scotland to Poland and Russia, from Scandinavia to Italy. The eerie tramp of the ghostly horse which carries Lenore to her doom re-echoed in every literature, and to many a young sensitive soul was the revelation of a new world of poetry. No production of the German "Sturm und Drang"—not even Goethe's Werther, which appeared a few months later—had such far-reaching effects on other literatures as Bürger's Lenore; it helped materially to call the Romantic movement in Europe to life. "Lenore" had tremendous influence on the literature of the late eighteenth- and early [n]ineteenth-centuries, and in fact, today's popular horror books and movies are still feeling the reverberations. [...] In short, Bürger’s achievement, while minor in itself, helped father an international movement that led directly to the massive popularity of Gothic works then and now. [...] As the Gothic novel borrowed many of its original conventions from the German ballads, as popularized by "Lenore," we can fairly say that Bürger is one of the most influential founding fathers of the Gothic and horror genres. "Lenore" was an immediate sensation in Germany and was widely translated into different languages, which brought it a great deal of popularity in many European countries and the United States, and also generated numerous "imitations, parodies, [and] adaptations". Its first English translation was published in March 1796, when William Taylor's rendering of the ballad, "Ellenore", appeared in the Monthly Magazine. The translation, however, was completed in 1790, and it had already been "declaimed, applauded and much discussed in Norwich literary circles". After Walter Scott heard how enthusiastically a crowd at Dugald Stewart's house had reacted to a reading of Taylor's version done by Anna Laetitia Barbauld, he attempted to acquire a manuscript of Bürger's original. In 1794, when he had finally received one, he was so impressed by it that he made his own rendering, William and Helen, in less than a day. Scott's version was passed from hand to hand, and was extremely well received. In 1796, three new English translations were published by William Robert Spencer, Henry James Pye and John Thomas Stanley. Translations by James Beresford and Dante Gabriel Rossetti were published in 1800 and 1844, respectively, and both have been hailed as the most faithful translations of Bürger's original work. Other notable translators of "Lenore" into English include Frederic Shoberl, Julia Margaret Cameron and John Oxenford. Sigmund Zois and France Prešeren translated the ballad into Slovenian, while Vasily Zhukovsky and Pavel Katenin published translations in Russian. A version in Italian was made by Giovanni Berchet and both Leopoldo Augusto de Cueto and Juan Valera made their own translations to Spanish. Gérard de Nerval, who was obsessed with the text, published five translations in French, two in prose and three in verse. Between 1797 and 1800, Samuel Taylor Coleridge wrote Christabel, which according to some German critics was influenced by Bürger's "Lenore". Percy Bysshe Shelley was also impressed by "Lenore" and treasured a copy of the poem which he had handwritten himself. Shelley biographer Charles S. Middleton further suggests that "it is hinted, somewhat plausibly, that the Leonora of Bürgher first awakened his poetic faculty. A tale of such beauty and terror might well have kindled his lively imagination". Influences of Bürger's poem on "Monk" Lewis, John Keats and William Wordsworth have also been noted, and some of its verses have been used by other authors on their own works. The verse die Todten Reiten schnell ("The dead travel fast") is also particularly famous for being cited by Bram Stoker in the first chapter of his novel Dracula (1897). Charles Dickens alludes to the thought that "The dead travel fast" in A Christmas Carol (1843), during an exchange between Scrooge and the ghost of Marley ("You travel fast?" said Scrooge. "On the wings of the wind," replied the Ghost.) The verse Laß sie ruhn, die Todten ("Leave the dead in peace") and the poem would later inspire a story of the same title by Ernst Raupach. In 1828, Karl von Holtei wrote Lenore, a dramatization of Bürger's ballad which achieved great popularity. Several composers have written pieces based on, or inspired by, "Lenore". Joachim Raff's Symphony No .5, named Lenore, one of his best-regarded works and which he finished writing in 1872, has been described by pianist Donald Ellman as "a most important pivotal work between early and late-romantic styles". In 1874, Henri Duparc wrote his symphonic poem Lénore, which was then arranged for two pianos by Camille Saint-Saëns and for piano duet by César Franck. Musicologist Julien Tiersot called it "one of the best models of its kind". Between 1857 and 1858, Franz Liszt wrote his first melodrama, Lenore, based on Bürger's ballad. Maria Theresia von Paradis also composed a ballad for voice and piano in 1789 based on "Lenore". "Lenore" has also inspired several illustrations by a large number of notable artists, including Carl Oesterley, Daniel Chodowiecki, Ary Scheffer, Horace Vernet, Johann Christian Ruhl, Hermann Pluddemann, Johann Heinrich Ramberg, Louis Boulanger, Otto Schubert, Eugen Napoleon Neureuther, Karl Friedrich Lessing, Frank Kirchbach, Georg Emanuel Opiz, William Blake, Franz Stassen, Franz Kolbrand, Octave Penguilly L'Haridon, Wilhelm Emelé, Alfred Elmore and Frank Stone. Lady Diana Beauclerk's depictions of the ballad were published in William Robert Spencer's rendering, while Daniel Maclise and Moritz Retzsch illustrated Julia Margaret Cameron and Frederic Shoberl's translations, respectively. ^ Garland, Henry; Mary Garland (1997). The Oxford Companion to German Literature. United States: Oxford University Press. p. 126. ISBN 978-0-19-815896-7. ^ Twitchell, James B. (1981). The Living Dead: A Study of the Vampire in Romantic Literature. Durham, N.C.: Duke University Press. p. 33. ISBN 978-0-8223-0789-1. ^ a b Summers, August Montague (1960). The Vampire, His Kith and Kin. Forgotten Books. p. 349. ISBN 978-1-60506-566-3. Retrieved 2010-09-10. ^ a b c Bluestein, G. (1963). "The Advantages of Barbarism: Herder and Whitman's Nationalism". Journal of the History of Ideas. 24 (1): 115–126. doi:10.2307/2707862. JSTOR 2707862. ^ a b Robertson, John George (1970). A history of German literature. Blackwood. pp. 246–247. ISBN 978-0-85158-103-3. Retrieved 2010-08-30. ^ "Poets Associated with Scott's An Apology for Tales of Terror". An Apology for Tales of Terror. The Walter Scott Digital Archive. Retrieved 2010-09-01. ^ Rossetti, Dante Gabriel (2009). Lenore. BiblioBazaar. p. 9. ISBN 978-1-110-41831-2. ^ Roper, Derek (1978). Reviewing before the Edinburgh, 1788–1802. University of Delaware Press. p. 259. ISBN 978-0-87413-128-4. ^ a b c d Summers, August Montague (1960). The Vampire, His Kith and Kin. Forgotten Books. p. 240. ISBN 978-1-60506-566-3. Retrieved 2010-08-29. ^ a b c Rossetti, Dante Gabriel (2009). Lenore. BiblioBazaar. pp. 11–12. ISBN 978-1-110-41831-2. ^ Martina Ožbot (2007-10-04). "Prešeren as a translator of Bürger's 'Lenore' and the development of Slovene poetry" (PDF). The Role of Translation in the Development of Slovenian Language and Literature. University of Ljubljana. p. 19. Retrieved 2010-09-11. ^ Bagby, Lewis (1990). Alexander Bestuzhevmarlinsky. Penn State Press. p. 59. ISBN 978-0-271-02613-8. ^ José Escobar (1986). "La literatura alemana en el Romanticismo español: la balada 'Lenore' de G. A. Bürger" (PDF). Actas del IX Congreso de la Asociación Internacional de Hispanistas (in Spanish). Centro Virtual Cervantes. Retrieved 2010-09-14. ^ a b Summers, August Montague (1960). The vampire, his kith and kin. Forgotten Books. p. 241. ISBN 978-1-60506-566-3. Retrieved 2010-09-09. ^ "Interview with Bram Stoker about Dracula". British Weekly. 1897-07-01. Retrieved 2010-08-28. ^ Dracula. Bram Stoker, 1897. Chapter 1. ^ "Karl von Holtei". Encyclopædia Britannica Online. Encyclopædia Britannica. Retrieved 2010-08-30. ^ "Joachim Raff: Symphony No. 5 Lenore". Joachim Raff Society. Retrieved 2010-08-30. ^ a b Northcote, Sydney (2008). The Songs of Henri Duparc. Brewster Press. pp. 45–46. ISBN 978-1-4437-3124-9. ^ Arnold, Ben (2002). The Liszt companion. United States of America: Greenwood Publishing Group. p. 434. ISBN 978-0-313-30689-1. ^ Fürst, Marion (2007-06-07). "Maria Theresia Paradis". Musik und Gender im Internet (in German). Hochschule für Musik und Theater Hamburg. Retrieved 2010-08-30. ^ "Illustrationen" (in German). G.A. Bürger und sein Museum. Retrieved 2010-09-10. This page was last edited on 28 October 2018, at 17:04 (UTC).